Oh, hi. Haven't touched this since April, in part because my beloved Nikon's battery door is broken and I've subsequently been on picture-taking hiatus. I also moved to Pittsburgh, where I spend the bulk of my days underlining passages (see: Occupation) and vainly seeking comfort in tiny glasses of Bushmills. Took awhile to get used to baking in a new kitchen, but let's face it: like shoe storage, there is no "enough" counter space. Following some disasters (burned apple muffins, broken plum cake), I'm slowly adjusting, and thanks to Steven's lovely photography, I bring you: Guinness cupcakes with Baileys buttercream icing. Adapted from Smitten Kitchen, Jan 2009. Equipment: cupcake/muffin pan(s), a piping bag/tip if you're into that, and an apple corer if you want to go the whole carbomb way and fill these with whiskey ganache. Deb says this makes 20-24 cupcakes. I made 12 for my Literary Criticism class & one 8" round. I've made these before with the ganache filling, but didn't get enough whiskey flavor to justify the work involved (cooling, coring, and filling each cake -- though, piping in the ganache is weirdly gratifying). If you skip this step, the cakes are equally enjoyable, and come together quickly. 1. Preheat to 350, line baking cups. Bring 1 cup Guinness and 1 cup butter to simmer in a large saucepan over medium heat. Once simmering, add cocoa powder and whisk until mixture is smooth. Cool while you move on. 2. Whisk dry (flour, sugar, baking soda, salt) in large bowl to blend. Have you ever just whisked sugar and flour together, rather than creaming sugar with butter? Crazy. 3. Using an electric mixer (I used handheld), blend the sour cream and eggs. Carefully add the chocolate beer mixture and mix to combine. Add flour mixture and beat on low to integrate. Use a rubber spatula to fold batter together, getting at any dry/unblended spots. Here, I transferred the batter to my 4 cup glass measure, because pouring from a spout really eases/speeds up filling the cupcake liners. Fill each about 3/4 of the way, and bake about 17 minutes. Cool on rack. 1. Chop up the chocolate and transfer to a heat-proof bowl. Heat up the cream to just under simmering, and pour it over the chocolate. Let sit for a minute, then stir until smooth. Add butter and whiskey. Cool. 2. You want the ganache thick but spreadable. Use a 1" cookie cutter (who has one?) or apple corer to hollow each cupcake -- be careful not to cut all the way through. 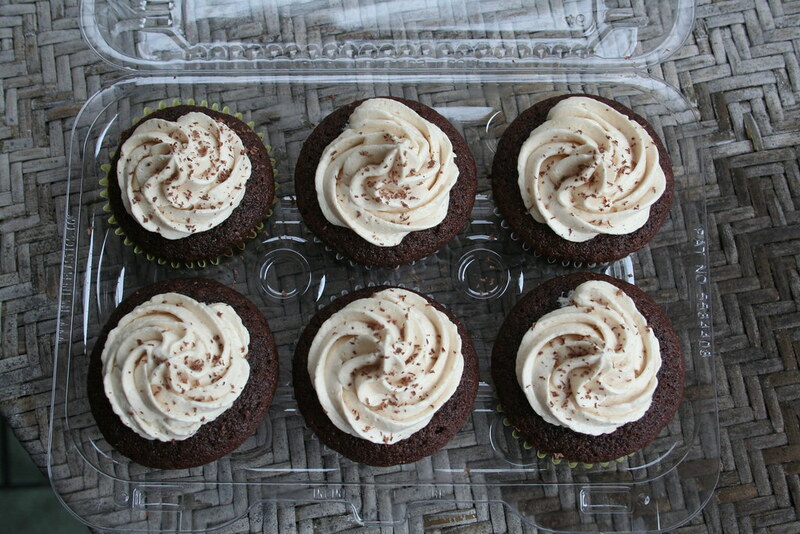 Put the ganache into a piping bag (or Ziploc with the tip cut off) and fill each cupcake to the top. 1. Whip the softened butter (a stand mixer helps) until very light and fluffy. 2. Add the powdered sugar a few tablespoons at a time. Deb attributes this trick (going gradually) to the Martha Stewart test kitchen; it may feel weird to add so much sugar, so slowly, to butter, and expect frosting to just happen. But happen it does. Taste as you go. When the frosting looks thick enough to spread, drizzle in the Baileys, and taste, and find your own balance between texture and flavor. 3. Ice the cupcakes. I used a wide star tip to make swirls, as pictured, and shaved a little leftover dark chocolate on top to finish. Some people think the Guinness bakes out, but these cakes are light and moist regardless. See Deb's original post or Irene's detailed adaptation for a more nuanced account.